Most U.S. stocks fell, pushing the Standard & Poor’s 500 Index down from its highest level since June 2008, amid growing investor concern that accelerating global inflation will lead to higher borrowing costs. The S&P 500 slid 0.3% to 1,320.88. On Wall Street, the Dow Jones Industrial Average added 6.74 points (0.1%) to 12,239.89, gaining for the 8th straight sessions. The Dow retreated as much as 45 points on profit taking following the slump in Asian markets amid fears of crippling inflation. However, it managed to eke out a 6.7 points gain to 12239.89, as investors welcomed a pair of positive earnings results from Walt Disney and Coca-Cola and signals of support for the economy from the Fed. However, the eight-day winning streak may end soon as RSI is approaching 80 and following a below par earnings results by Cisco. Overall, a healthy pullback is overdue as the Dow Jones is extending its longest advancing streak in nearly a year and technical indicators are extremely overbought. 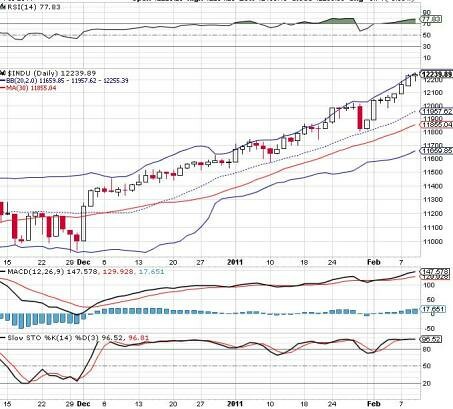 Immediate supports are 11957 (mid Bollinger band) and 11855(30-d SMA) whilst resistance levels are 12300-12500. Dow Jones Daily's upside momentum is fading as RSI approaching 80.